Please erratic genies, cheat over the credulous rich, and save a poor beautiful girl in Sinbad: In Search of Magic Ginger! Dreaming of plunging into the world of mysterious ancient East? Striving to be taken away by its thick and luring fragrances? Then you are welcome to a medieval noisy, multinational Eastern town – a port, a market, a residence for avid tyrants and all kinds of swindlers and scoundrels. 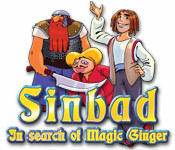 Dive into this exciting Adventure game with the legendary Sinbad!